Besides raw material, one of the big differentiators between premium and regular vinegars is the aging process. 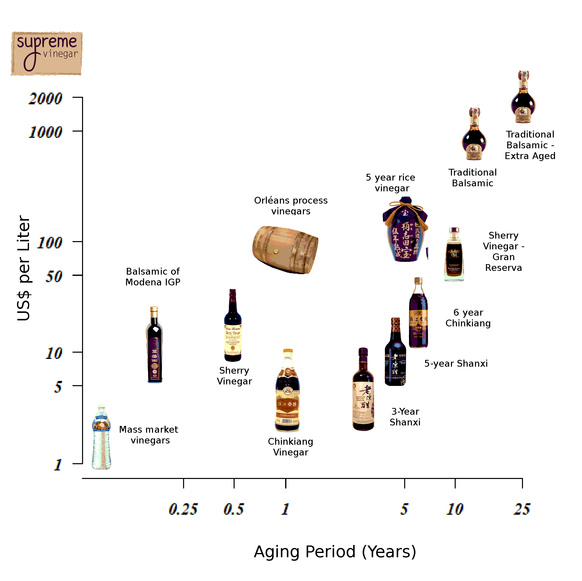 This can range from 2 months for Balsamic of Modena IGP to 6 months for basic sherry vinegar to 12 years for Gran Reserva Sherry or 25 years for Extra Aged (“extravecchio”) balsamic. Price varies accordingly. Below is a quick chart that gives an overview of the breakdown for the most common vinegars.